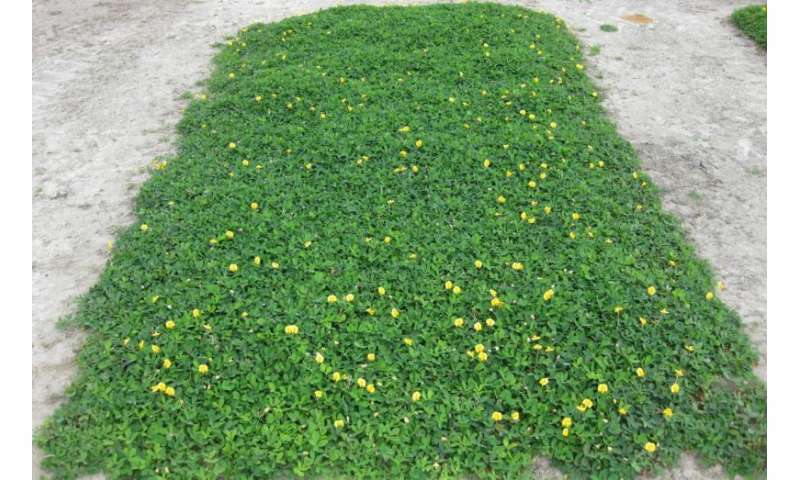 Photo shows the EX1 selection of rhizoma peanut (Arachis glabrata) in Quincy, Florida in April. The crop is an emerging option for groundcover in warm climates. Credit: Gary Knox. A new, ecologically friendly groundcover for warm-weather landscapes is on the horizon. Rhizoma peanut, a warm-season perennial native to South America, has been used almost exclusively as a forage crop in the United States since the 1930s, but a study in the July HortScience says the perennial has potential as an ornamental groundcover or turf alternative. "Rhizoma peanut is grown in U.S. Department of Agriculture hardiness zones 8b and greater of peninsular Florida and the U.S. Southern Coastal Plain where it is best adapted to coarse, sandy soils," explained Benjamin Anderson, lead author of the study. He noted that previous research has focused almost entirely on cultivars used for forage crops. "Lower growing forms of rhizoma peanut have received little attention for their potential use as an ornamental groundcover," Anderson added. In order to learn more about the plant's ornamental attributes such as maximum average canopy height, height variability, the time to reach full canopy cover, and the time at full canopy cover, scientists from the University of Florida studied seven released and nine experimental selections of rhizoma peanut. The plants were grown in full sun or under 30% shade at two North Florida locations. The experiments showed that establishment of plants (as measured by full canopy cover) did not occur until at least a year following planting. "At both locations in the study, maximum average height increased during the second year of the study, indicating that rhizome peanut will likely continue to increase in height for at least two years following planting," the authors noted. Canopy cover duration was affected most by rhizoma peanut selection. "The 30% level of shade used in this experiment did not have a significant effect on either the time to reach full canopy cover or canopy cover duration, indicating that for these two variables, shaded plots performed relatively similar to those in full sun," said the scientists. Shaded plots emerged later in the spring, but full sun plots died back earlier in the fall. "As a result, successful ornamental performance may occur in both full sun and shaded conditions," the researchers said. The scientists noted that ornamental attributes of rhizome peanut could be achieved by utilizing landscape management practices such as mowing. "Mowing may be particularly important for aesthetics and may allow a wider range of rhizoma peanut germplasm to be used ornamentally," the authors said.